We are an Anabaptist Mennonite Community situated in the heart of Wichita, Kansas (see the map). As of September 2016, we have 22 covenanted members, 8 children under the age of eighteen, and about 5 non-member participants. We are dedicated to following Christ in the radical tradition of Anabaptist-Mennonites. We are members of the Mennonite Church U.S.A.
Mennonites trace their lineage back to Menno Simons, a leader of the Anabaptist movement during the 16th century Reformation. As followers of Christ, the Anabaptists embraced nonviolence, loved neighbor and enemy, built a community of equals, and shared materially. We try to bring that commitment and spirit to the city of Wichita in the 21st century. 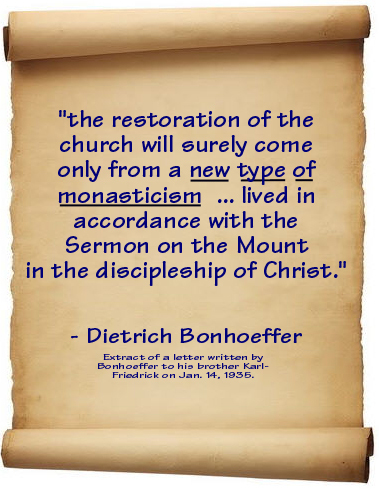 We also identify with the "New Monastic Movement," which is characterized by twelve marks. These marks include, practicing spiritual disciplines as the way of Christ, sharing economic resources with community members, practicing hospitality to the stranger, humble submission to Christ's body (the church), nurturing the common life, and keeping the Rule of Christ (Matt. 18:15-20). Every year during Easter week, we gather to renew our membership or become a new member by signing the following covenant. We commit ourselves to following Jesus Christ, through whom God has made friends with the world and in whom we continue the the work of reconciliation. We commit ourselves to each other, the church, to love our brothers and sisters in Gods family, sharing our decisions, our talents, our time, and our possessions. We commit ourselves to caring for the world, to bringing good news to the poor and setting free the oppressed, to proclaiming Jesus the Servant as Liberator and Lord. We commit ourselves to the way of the cross, to a life of simplicity and prayer, in this is our joy, peace, and new life. To supplement Our Covenant, we have written Our Understandings, which function like "by-laws" for the church. It clarifies the meaning of the covenant, the process we call covenanting, church life, and leadership. We affirmed our current Understandings on November 17, 2013. 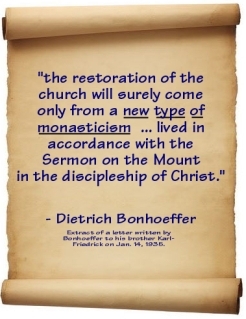 We affirm A Confession of Faith in a Mennonite Perspective (Scottdale, Pennsylvania, Herald, 1996). Here is an official summary. We maintain a small Sharing Fund in an account separate from our general fund for the specific purpose of aiding members and participants who have financial needs. Such money can be considered a l.o.a.n or a gift. These funds are made available by the treasurer after approval by at least two members of the Church Council (excepting the pastor and the treasurer). The current Sharing Fund Policy (June 15, 2014) gives details for administration of this fund. Our mission is to build "a community covenanted to follow the way of Jesus Christ through practicing peace and reconciliation, sharing our lives in love and accountability, and bringing the good news of the Reign of God to the world." Etching of Dirk Willems, who rescued his jailor, but was then executed for being an Anabaptist (1569). Source: John S. Oyer and Robert Kreider, Mirror of the Martyrs (Good Books, 1990). Our safe sanctuary policy offers precautionary guidelines in a spirity of care for the most vulnerable among us. We recognized that the care of children rests not just with parents but the entire church community, and we encourage everyone to be diligent about the care of our children.